In continuing to make installation faster and better for the installer, TOA has included built-in output channel speaker EQ settings in the software that’s available for this mixer amplifier and we wanted to remind our installers of this added benefit. There are 30+ speaker EQs to choose from for many popular models of our TOA speakers. 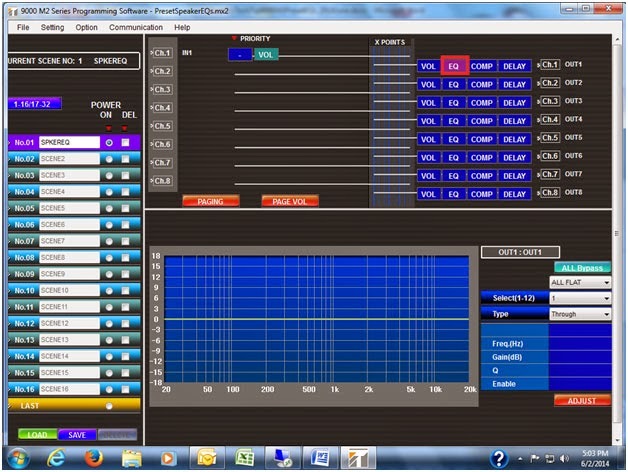 These EQs will make your project sound better and sound more uniform, yielding a better installation result. This should make a happier customer and generate a better potential for a repeat customer or even new business due to positive word of mouth, or should we bring ourselves more up to date like word of Twitter, Facebook, Instagram, etc. Dare I say e-mail? Implementing EQ settings is very easy. First open your software project so that you get the main screen as shown below. Then click on the Blue EQ button of the channel you want to equalize. The EQ page will display at the bottom of the screen. Remember for EQ settings, you will have to click on the EQ button for each channel you want to equalize. This is different from the other output settings which will display all channels at the bottom of the screen. This I primarily due to EQ information takes up too much space to be able to display all EQ channels at the same time. You will see the list of speaker options to choose from as shown below. Once you click on the speaker option needed, the EQ curve(s) will be available for review on the lower part of the screen. The HX-5 speaker is listed in this example. If you would like to review the EQ frequency points, click on the dropdown for the Select (1-12). There you will have up to twelve points that can be reviewed if available. Some speakers may only have 1 or 2 points where other speakers might have 7 or 8 points. In the case of the HX-5, there are 5 points that you can review. As you review EQ points, when the next point number to be reviewed lists “Through,” then there are no more points for that speaker. Now for an additional programming trick. If you have multiple channels with the same speaker, you can copy paste from one channel to another. Here are the simple steps for this. on the top part of your screen and select Copy. was chosen. That’s it. You will be able to confirm the curve on the bottom of the screen. Now some final notes regarding Preset EQs. Preset EQs can only be initially set from the programming software, not by the front panel controls of the mixer amplifier. Once set and loaded to the mixer amplifier, Preset EQs can be turned on and off via the front panel. Preset EQs can only be reviewed, not changed. If you need to change a point in a Preset EQ for your installation application, you will need to review the EQ points as described above and write down the parameters for each point. Then you can modify the EQ curve as necessary by creating your own EQ curve from the software or the front panel controls. Importantly remember to save your scene for the EQ settings you have made. Don’t for get to save the project to your computer as well for backup. Lastly click on Communication and select Upload PC to 9000 > All Data, to get your changes in the amplifier mixer.